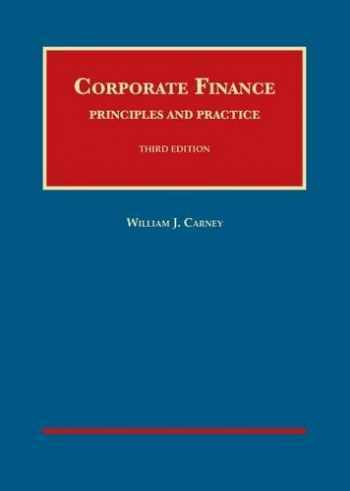 Acknowledged author William Carney wrote Corporate Finance: Principles and Practice, 3d (University Casebook Series) comprising 902 pages back in 2014. Textbook and etextbook are published under ISBN 1609304586 and 9781609304584. Since then Corporate Finance: Principles and Practice, 3d (University Casebook Series) textbook received total rating of 4 stars and was available to sell back to BooksRun online for the top buyback price of $73.05 or rent at the marketplace. This casebook provides a finance-oriented approach to corporate law, focusing on what students will need to know in corporate practice.Students learn:Financial fundamentals, such as balance sheets, income, and cash flow, as well as more complex topics, such as corporate debt and convertible securitiesApplication of financial principles to analyze and understand case studiesContractual solutions employed to deal with the various conflicts and ambiguities that ariseAdditionally, the text covers a broad range of topics from pricing models to the poison pill and includes a table of cases.